MaxBans is a project I've been writing for my server, MaxGamer. I struggled to find a banning plugin that wasn't a joke, and the good plugins were all designed for Premium servers anyway. Nothing gave us the tools that SHOULD have been out there - Like temp mutes, temp IP bans, duplicate IP lookups, and good autocompletion! It is thoroughly tested on an Offline-Mode server, so you can bet it's rock solid and feather light! DNSBL lookups to stop proxys! Multiline kick messages! No more running off the screen! Notifications when a banned player tries to join! Block commands like /me when muted! /mbdebug - Outputs debug information for me if you're having issues! /mbimport - Imports vanilla minecraft (And others) bans. /mbexport - Export bans to vanilla, MySQL or SQLite databases. (Allows swapping SQLite <-> MySQL), and others ban plugins. 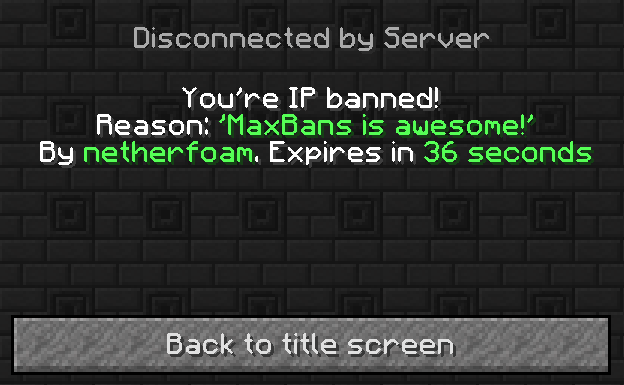 /rangeban <ip1-ip2> [reason] - Bans the IP range from ip1 to ip2 for the supplied reason. /unrangeban <ip> - Removes any RangeBan which overlaps with the given IP. Eg, if 127.0.0.1-127.0.0.5 is banned, unbanning 127.0.0.3 will lift the whole ban on 127.0.0.1-127.0.0.5. /tempban NewGuy101 -s 1 hour MaxBans is Awesome! - Nobody will see the announcement that NewGuy101 was temp banned, just the fact he "has left the game." This is an in-depth guide on how to configure MaxBans :) If I've missed anything, ask in the comments! This is a list of common issues people have with MaxBans, such as plugin conflicts. Check out this guy's work for an amazing webpage setup to view MaxBans while using MySQL. Demo (dont download from here): http://yive.me/maxbans/. Its updated and is working on latest version of MaxBans! These stats can be disabled using the PluginMetrics config file (BukkitServer/plugins/PluginMetrics/config.yml). MaxBans will download a GeoIP.csv file, which allows it to look up the country of origin for IP addresses. The file is downloaded directly from maxmind GeopIP site. The file is only downloaded once (Unless it is renamed/removed). Hello all. I am other dev and now i assuming the Project for bugfixes and possible improvements. You say I can block certain commands when players are muted? I would like to know how becasue currently they can /msg and /helpop, etc. Change the Temp Ban time limit to be set to at least a month? Hope I get some help, especially with dupeip and uuid because that is quite necessary. As well as the blocked commands. The permission system is quite simple - just "maxbans.desired command / feature"
May I check how do set freeze message and ban appeal message? Hello，I come from China, your plugin is great, I want to take this plugin to MCBBS.net, do you agree? can you add a future where you type unbanall and it unbans all players? Tempban and Ban are not working? People can login when they're banned, Can I get some help? Thanks. Hello, my name is Piva, I wanted the MaxBans team to add a little something to the posts: Message from "You're mutated! Expires on:"
== Hello greetings My name is Joe, I am a YouTuber who does tutorials on the minecraft plugin and I am happy to tell you that I made one of your PLUGIN MXBANS And I would like you to check it out and if you like it you can add it to your post. i Have a Problem a Supporter has Kick Perms and the Supporter can Kick me #i am a Owner with OP why it's this so ? and can that fixed ?